The PH-200 is ideal for all pH testing, water purification applications, wastewater regulation, aquaculture, hydroponics, colloidal silver, labs & scientific testing, pools & spas, ecology testing, boilers & cooling towers, water treatment, wine, coffee, agriculture and more. 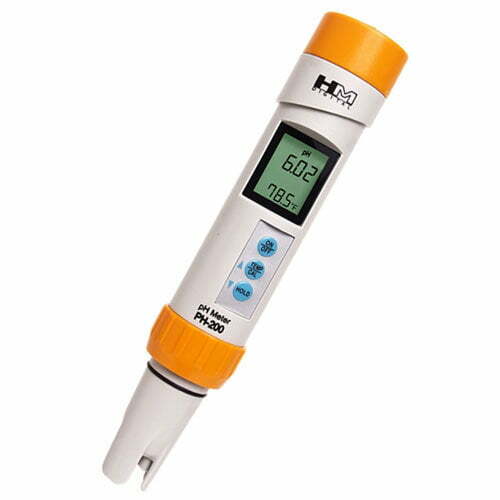 The PH200 pH Meter measures pH and temperature. 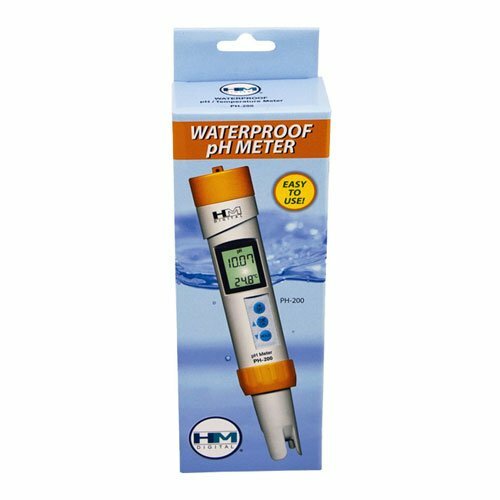 The HM Digital pH Meter has auto-ranging three point calibration with digital fine tuning. This PH-200 Tester includes storage solution in a sponge embedded in a clear cap. This Meter comes with waterproof housing (IP-67 rating). The PH-200 pH Meter simultaneously displays temperature. The PH-200 meter comes with digital automatic calibration (one point) and digital fine tuning. This Meter has automatic temperature compensation (ATC). 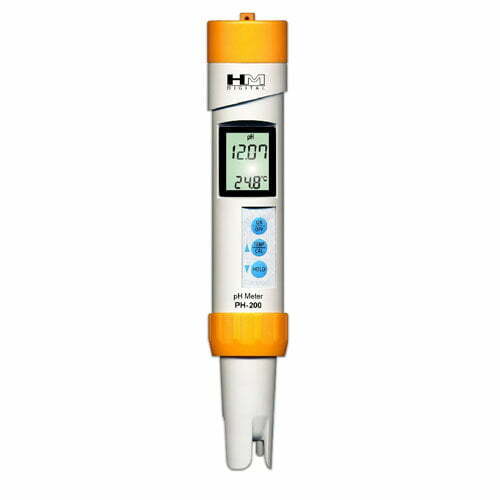 This pH Testers is equipped with auto-off function, data-hold function and low-battery indicator. The Sensor for pH Meter is replaceable with the SP-P2 sensor available below. The meter also includes a cap, batteries, lanyard, and pH 7.0 buffer. pH Range: 0 – 14. Temperature Range: 0-80 degrees C; 32-176 degrees F.
Temperature resolution is 0.1 degrees C/F. Calibration: Digital automatic calibration with digital fine tuning. Probe: Replaceable glass sensor and reference tube electrodes. Power source: 3 x 1.5V button cell batteries (included). Dimensions: 7.3″ H x 1.3″ W x 1.3″ D. Weight: 3.4 oz.